For other uses of "Desman", see Desman (disambiguation). 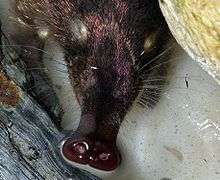 The desman, a snouted and naked-tailed diving insectivore of the tribe Desmanini, belongs to one of two Eurasian species of the mole family, Talpidae. This tribe consists of two monotypic genera of semiaquatic insectivores found in Europe: one in Russia and the other in the northwest of the Iberian peninsula and Pyrenees. Both species are considered to be vulnerable. They have webbed paws and their front paws are not well adapted for digging. "Russians rally for water mammal". BBC News Online. 2006-06-09. Retrieved 2012-09-05. One of the main characters in Noah's Island, Sacha, is a friendly but simple-minded desman known for the catchphrase "Oisky Poisky". In the novel "The Truelove" by Patrick O'Brian the naval surgeon and naturalist Steven Maturin recalls his excitement at the age of eight at his first sighting of "the Pyranean desman". ↑ Hutterer, R. (2005). Wilson, D.E. ; Reeder, D.M., eds. Mammal Species of the World: A Taxonomic and Geographic Reference (3rd ed.). Johns Hopkins University Press. p. 303. ISBN 978-0-8018-8221-0. OCLC 62265494.